I’ve been trying to up my sysadmin game over the last several months using a lot of different server configurations on AWS (Linux, IIS, etc.). Mainly I’m writing this post because I’ve implemented this server-side caching setup three times now, and every time I do, I end up having to go back to the drawing board to figure out what I did and how I did it. I’ve already talked about a way to use NGINX as a proxy server, so this is just another way to make your server a bit fancy. For those of you looking to improve the performance of your website or app, there are lots our routes you can take, and a lot of them have to do with the server environment. Sever-side caching really helps when you have any kind of page that takes a long time to generate and that doesn’t change very often. Here’s a diagram to illustrate the helpfulness of this technique. When someone makes a request to a webpage, it usually hits the web server first, and the server decides what to do with this request. In most cases, it forwards the request along to some sort of application in the case of any kind of dynamic page. The application, whether that is WordPress, Node, or any other framework, looks at the URL requested and then decides what to do. In most cases, the application makes a call to the database, waits for that information, processes it using some sort of template and other logic, then returns the HTML content to the web server to send back to the browser. It’s a bit nuts to think that this goes on for the the majority of pages you visit everyday, but that’s mostly the case nowadays. But, it’s easy to see how this paradigm could slow things down. What if we need to make a series of calls to the database to get the needed data to assemble a page? What if we need to make 15 calls, but we need to make them in succession, meaning we need the data from each call to populate the query for the next call? What if we are fetching data from some external API and we want to ensure that our site responds with an appropriate 200 response even if the external service is down? These are all great use cases for some sort of server-side cache. 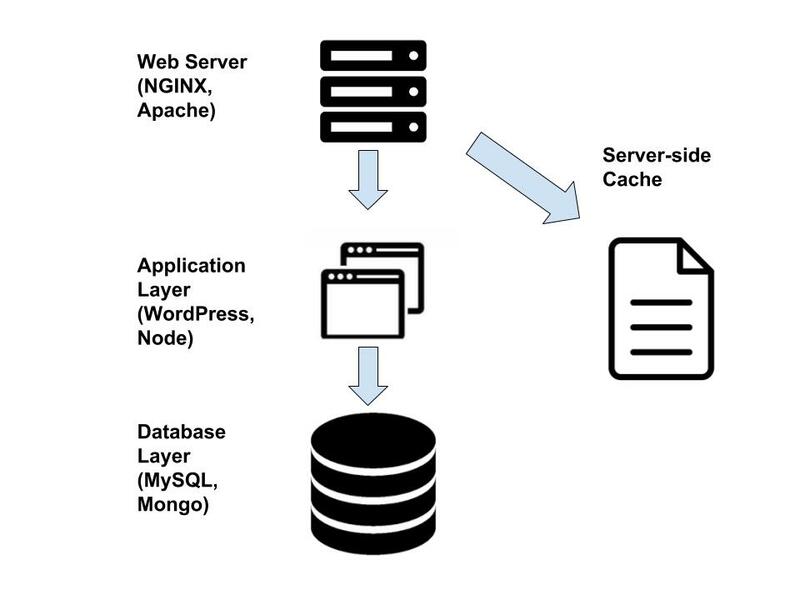 A server-side cache is basically just a folder on the server that stores copies of files that have been requested. Then, when someone requests that file again, it just goes to the cache to get it instead of following the procedure outlined above to get it from the actual application. For pages that are “expensive” to generate, this can make a huge difference. There are several standalone technologies that provide caching support, such as memcache and Redis, but NGINX is a more-than-capable web cache on its own. This snippet should have enough comments for you to get something working, but there are lots of ways to fine tune this thing once you have a better understanding of the requirements.